The convective season is beginning over Europe and the severe thunderstorms of yesterday, 16th April, are a good example of that. We have received a number of severe weather reports from Slovenia and southeastern Austria, where flash floods and large hail up to 3 cm in diameter occurred in the late afternoon (Fig. 1). The event that received the most attention was a flash flood in Graz, with rainfall totals of up 80 mm. A number of streets, as well as cellars, parking lots and even the shopping mall, were flooded. Fig. 1 Severe weather reports collected for 14 April 2018 across Slovenia and southeastern Austria. Blue circles denote heavy rainfall reports and green triangles large hail reports. Anticipating situations conducive to flash flooding may be quite tricky, as it often takes a quasi-stationary, long-lived thunderstorm to deliver several waves of heavy rainfall over an area. Yesterday was no exception. 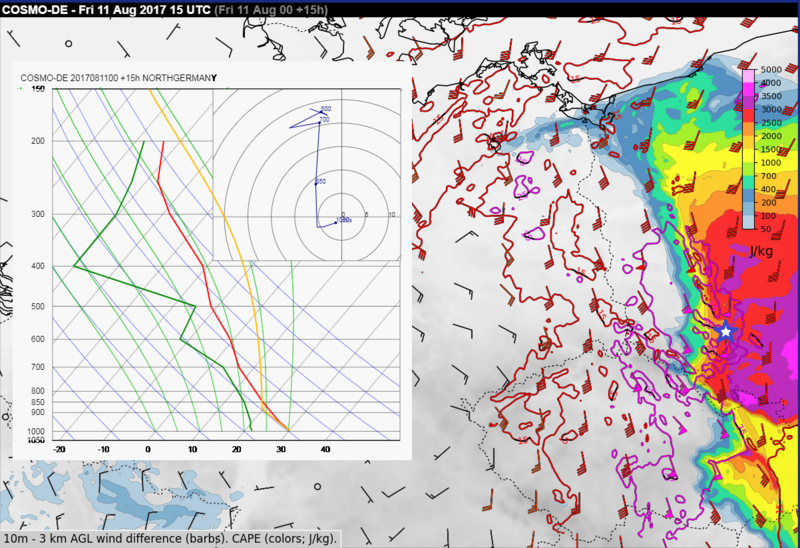 Thunderstorms formed in an environment featuring moist, southeasterly flow at the surface, CAPE values on the order of several hundred J/kg and an increasing southerly flow aloft (Fig. 2). A very moist profile in low to mid troposphere along with low cloud bases was evident, both from the forecast sounding over southeastern Austria and from the observed sounding in Zagreb, Croatia (Fig. 3). These conditions suggested a potential for very heavy rainfall with thunderstorms as little precipitation would evaporate when falling from the cloud. Fig. 2 A 15 UTC forecast ICON-EU forecast of 10 m wind (arrows) and 2 m dew-point (colours), initialized at 00 UTC. Forecast sounding was taken at the location marked by red star. Fig. 3 12 UTC sounding taken at Zagreb. Courtesy of University of Wyoming. Even so, the increasingly southerly flow aloft meant that thunderstorms could hardly stay confined to one location and would move northward with time. Yet, that has not happened, as one can see from this radar animation shared by ZAMG, which reveals a number of instances of storms stagnating over one particular location. This is because storms were propagating (propagation represents the movement of the thunderstorm caused by the formation of new cells) along the convergence zone towards the moister and more unstable airmass in the south. With a mid- to upper-tropospheric flow almost parallel to the convergence zone and the propagation cancelling out the advection of individual cells to the north by mean wind, some of the thunderstorm clusters became quasi-stationary and produced excessive rainfall. Fig. 4 16:00 UTC satellite (combination of visible and infrared channels) and radar (OPERA composite) imagery. 2m temperature (red numbers), 2 m dewpoint (green numbers) and 10 m wind (barbs) are plotted for individual stations. Thick black line denotes the approximate location of convergence zone. OPERA radar data © EUMETNET, satellite data © EUMETSAT. This case shows how demanding it can be to correctly anticipate flash flood situations with thunderstorms when numerical models underestimate the rainfall sums, which is often the case with convective phenomena. 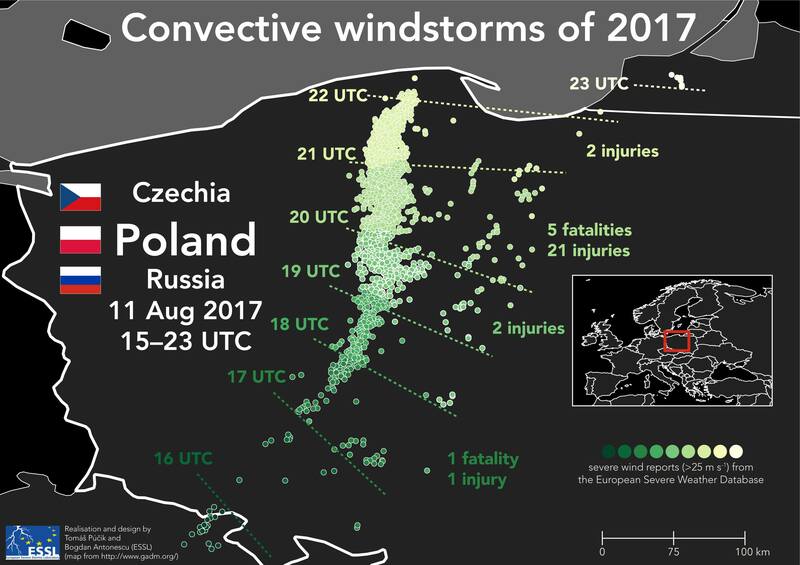 The third most socially impactful convective windstorm case in 2017 occurred on 11 August, in a belt from the northern Czech Republic to northern Poland with 6 fatalities and many injuries. Fig. 1 Chronological progression of severe wind reports in a convective windstorm of 11 August 2017 across northern Czech Republic and Poland. Fig. 2 Composite image of maximum reflectivity in vertical column at the hourly time steps between 15 and 23 UTC. Courtesy of Mateusz Taszarek and IMGW. At the height of the storm, 180 000 customers were out of power and many roads were blocked by fallen trees. Damage to the forestry was widespread (Fig. 4) with 39 200 ha of forests completely destroyed and 40 500 ha partially damaged. The volume of fallen wood reached almost 10 millions of m³. 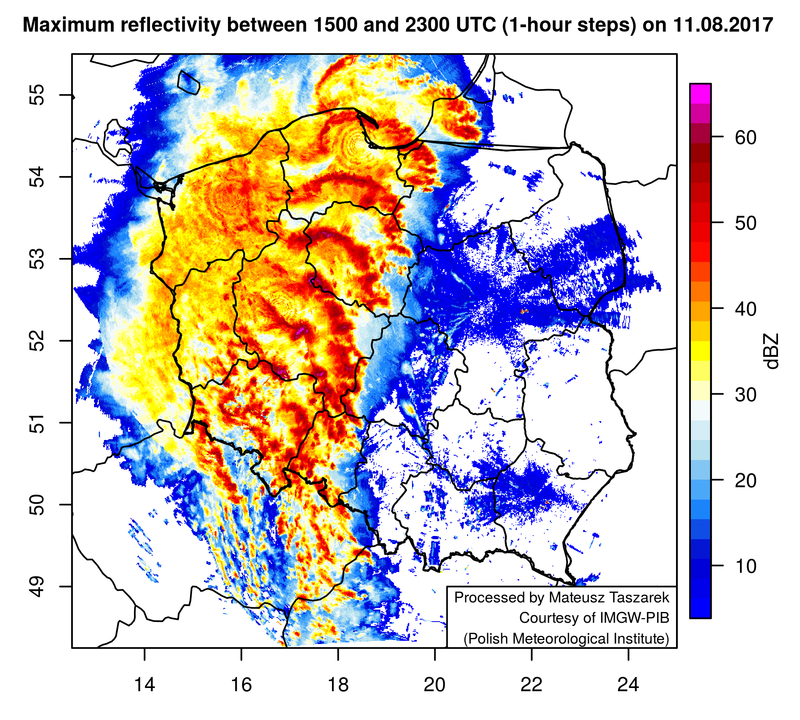 Together with 20 000 damaged buildings and financial costs of the storm estimated in the range of 500 millions to 1 billion €, this was likely the most impactful convective storm to hit Poland in decades. Fig. 4 Aftermath of the 11 August 2017 convective windstorm in Poland. Photo by Grzegorz Zawiślak. This convective storm was also record breaking for the ESWD. 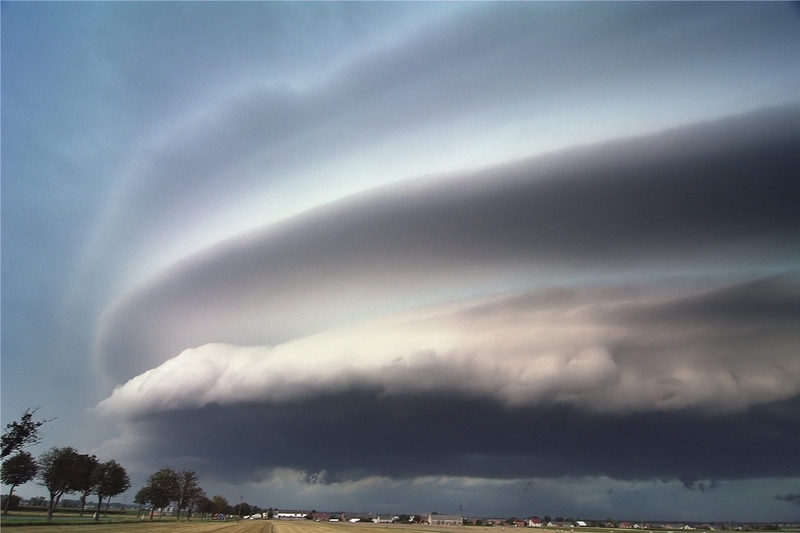 Altogether, more than 1200 severe weather reports were collected, which constitutes most reports ever submitted per event in the history of the database. 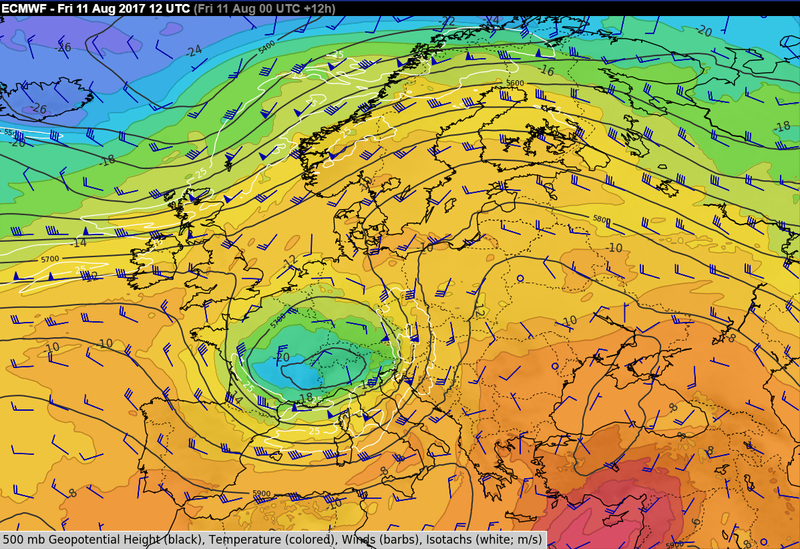 Environment capable of such extreme convective windstorm featured a deep cyclone at 500 hPa centered over the Alpine range with a belt of 20 + m/s southerly flow stretching from Croatia towards western Poland (Fig. 5). A short-wave trough was translating from Austria northwards. At the same time, a wavy frontal boundary extended from northwestern Austria through the Czech Republic into eastern Germany and western Poland (Fig. 6). 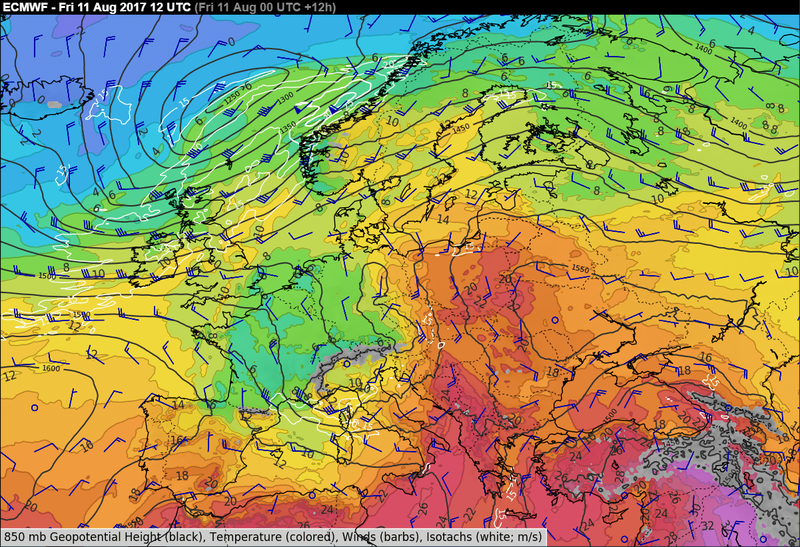 In this setup, a warm and humid airmass has advected over Poland, with 2 m dew points exceeding 20 °C. Combination of high values of CAPE and a strong lower tropospheric shear, exceeding 20 m/s in the 0-3 km layer, created very favourable conditions for development of a bow echo (Fig. 7). Lift provided by cold pool from the already ongoing convective system and a well defined convergence zone located across western Poland resulted in widespread initiation of new convective cells, which quickly merged into a large convective system. Fig. 5 ECMWF forecast of 500 hPa geopotential height (black contours), temperature (colors) and wind (barbs) for 11 August 12 UTC, initialized at 00 UTC. Fig. 6 ECMWF forecast of 850 hPa geopotential height (black contours), temperature (colors) and wind (barbs) for 11 August 12 UTC, initialized at 00 UTC. Fig. 7 COSMO-DE forecast of CAPE (colors, J/kg) and 0-3 km bulk vertical wind shear (barbs and contours, m/s) for 11 August 15 UTC, initialized at 00 UTC. Forecast sounding and hodograph correspond to the location marked by a blue star. ESSL would like to thank Skywarn Polska and Amateur Meteorological Society of the Czech Republic for many submitted reports documenting the windstorm case. Furthermore, thank you goes to Artur Surowiecki for information on the impacts of the storm, Mateusz Taszarek and IMGW for the radar data, and Grzegorz Zawiślak for the photo of windstorm damage. 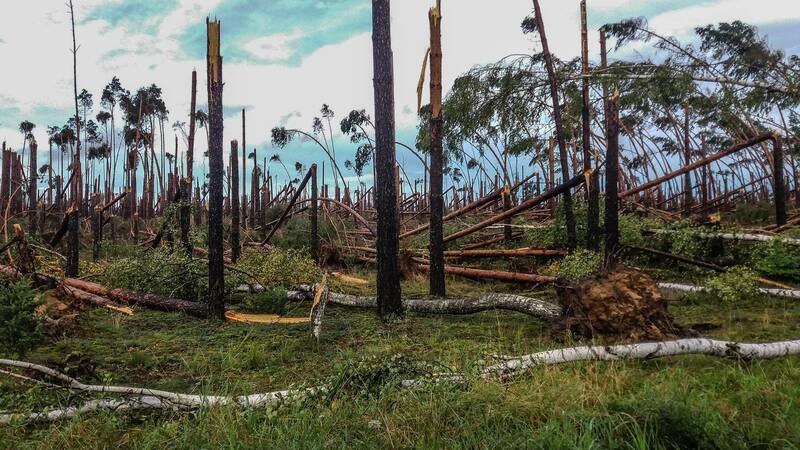 Additional information regarding the windstorm impacts in the Czech Republic can be found here (in Czech) and regarding the forest damage in Poland here (in Polish).